Just like lobster rolls found their way onto lunch menus nationwide, Account Based Marketing (ABM) seems to have transcended buzzword status to become an ideal model for many B2B marketers. And why wouldn’t it? The benefits of ABM—enduring relationships, bigger share of wallet—are mouthwatering for marketers eager to connect in meaningful ways. But when it comes to implementing the right metrics and campaigns for an ABM program, many teams are applying the same tactics used in traditional demand generation. And as the saying goes, if you do what you’ve always done, you’re going to get what you’ve always gotten. Here’s a major difference between the traditional demand gen and an ABM approach: the number and opportunity within accounts targeted. ABM pursues a select group of major customers and approaches them with a highly customized experience and dedicated account team. ABM teams don’t view anyone as just “an account”—they consider a holistic view of each buying influence and leader from a personalized standpoint, including how they relate to each other. 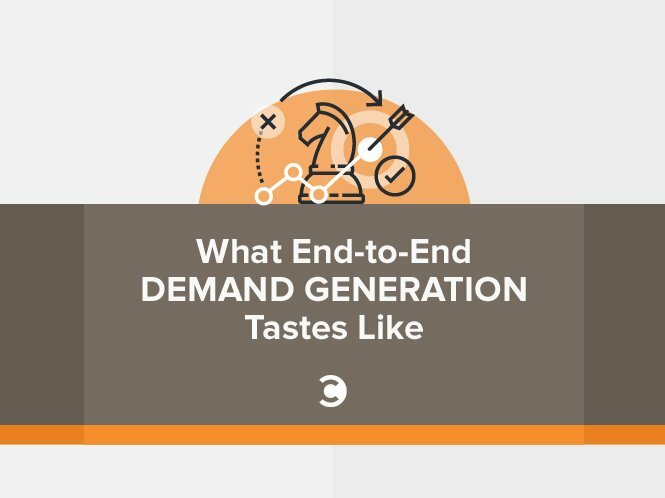 The result is end to end demand generation—what we call an ABM sandwich. So what does it take to really master ABM? Well, speaking of sandwiches, it helps to be hungry. Your team has to have an appetite for this—no one can just dial it in, because you can’t fake the connection that makes ABM work. That said, a certain patience is required. Just like you can’t slap together a Dagwood without investing some energy and thought, successful ABM relationships are built on a foundation that takes time and dedication to build. Here’s what it takes to offer an ABM sandwich. ABM marketers prioritize quality over quantity when it comes to getting the right accounts. Just like the difference between a gourmet sandwich and a lunchroom PB&J, you’re going to be choosy about using the highest quality, most flavorful ingredients. Instead of chasing after just any customer, you’ll evaluate your target market and pursue accounts with the most potential. That means using the right data to go beyond transactional goals and identify accounts with upselling and cross-selling potential. The selection criteria is a major distinction between the ABM approach and traditional marketing. To hone in on the right accounts for you, you’ll focus on data and insights such as industry profiling, corporate goals and performance, competitive overview, persona development, current penetration rate vs. opportunity, and other traits that can distinguish the right customized approach. If your team has previously operated under the philosophy of “more is more,” you’ll need to change your thinking. Ever had one of those New York novelty sandwiches that are so big you can’t finish eating it? That’s the last thing you want in ABM. Nope, you want something much more refined and elegant, like a tea sandwich. Aim for a manageable number of accounts—usually 25 or less is the sweet spot that lets your team devote the best and most relevant attention to driving amazing results. This won’t limit revenue if you’ve carefully targeted accounts where you can grow the relationship. Targeting a specific vertical could help you develop a common message that can resonate across your ideal targets, allowing you to obtain some scale more efficiently. The first time you prepare a Croque Monsieur, you might not be too successful. But when you know how to work with the butter, milk, nutmeg, and ham, you’ll have much better results. The same applies to ABM: you need to understand each account in detail, from their purchasing process to their personas, so you can offer relevant conversations across all channels. What is your contact strategy? How can you best develop campaigns that speak to the most subtle details of the persona’s buying journey? Consider holding workshops to create key messaging and positioning for each account. Generic engagement strategies have no place in ABM; all of your integrated marketing tactics, like email, nurture, thought leadership, social, events, and retargeting, will be tailored to each account. To do this, you’ll need the right tools, and that’s where marketing automation comes in. By measuring lead responses (just like you measure ingredients) and customizing your campaigns based on data, you’ll offer up the relevance that will build savory ABM relationships. There’s little room for mass emails or generic campaigns; every touchpoint must feel meaningful and personalized. Given the number of channels and touchpoints in play with ABM, your sales reps must understand how to nurture and convert your prospects. Just like bread alone does not make a sandwich, teams that are comfortable only with one channel or tactic won’t be effective, given that they must know how to drive synergy across all the ingredients of the channels. Also important: following the latest news about each account, from company developments to changes in the buyer personas and senior leaders. ABM builds relationships that last, and that requires ongoing support with engaged sales reps and even a success manager to keep the customer connected and engaged. Customers, buying objections, competitive positioning, and other factors will always evolve over time. But, just like you can develop a taste for a New England lobster roll, your hard work can result in your business being the top-of-mind choice for doing business. If your product impacts HR, IT, and marketing, you’ll need to follow personas based on those areas. Your team should study opportunities to increase your depth in each account, while understanding when not to waste resources on prospects who aren’t a good fit. When it comes to measuring success, ABM metrics will go beyond the traditional demand gen metrics like MQL, SAL, SQL, closed/won, and pipeline revenue. Those still matter in ABM, but your metrics can take on different flavors, like account growth, share of wallet, product penetration and usage, depth and breadth of engaged contacts across divisions, and general engagement metrics. It’s a safe bet your channels or tactics will vary over time; what matters is turning your data into a map to find out how you can best serve the account through its changing needs. By now, after following these three steps, you should be serving tasty end-to-end ABM demand gen your customers will gobble up. Just monitor your effectiveness through the right KPIs, and you’ll have the insights you need to make your next sandwich taste even better. Ray Kemper is chief marketing officer at Televerde, providers of demand generation solutions, marketing technology services, engagement strategy content, and planning and data consulting services.